Have you recently noticed that your kitchen cabinets are no longer appealing? The fact that they seem worn-out should not surprise you, as a kitchen environment is not very furniture-friendly. Grimy hands and that annoying grease that spreads everywhere when you cook French fries will sooner or later affect your kitchen cabinets. Don’t despair because there are smart ways of refreshing kitchen cabinets without having to spend enormous amounts of money. 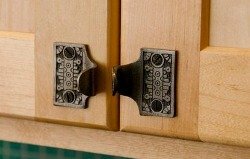 Your cabinets will look much better if you provide them with pulls and knobs. As a general rule, cabinet hardware is not very affordable and a single ornate knob might end up costing up to $30. However, you can save a lot of money if you visit box stores, where you’ll find cheaper kitchen cabinet drawer pulls for $20. If you want to save both time and money, you are advised to opt for the same type of hardware that you want to replace. For example, avoid replacing 1-hole hardware with 2-hole upgrades because this implies drilling or patching. Re-painting kitchen cabinets is one of the best upgrades you can make, as it will totally change appearances. A fresh layer of paint doesn’t cost much, and even if the process might take a while, the end results will surely exceed your expectations. Before you get started, try to make sure that you have several gallons of paint at hand, as well as sandpaper and cleaner. The best part is that any type of surface can be painted as long as you pay attention to the preparation process. For example, melamine and laminate finishes need to be roughed up with sandpaper and provided with a high-quality bonding primer before being re-painted. Not everybody knows that crown molding can make your kitchen cabinets look as good as new. Besides, the general price for such an upgrade is extremely affordable: 8 ft. of high-quality moulding with a lovely dentil design is roughly $20. Molding should be added when you re-paint the cabinets so that you can obtain a perfect match. 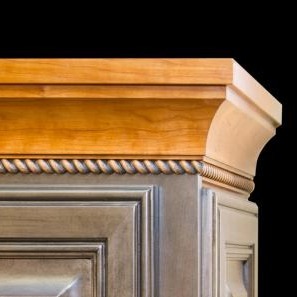 Wood molding can be ordered from the manufacturer of your cabinets, but you should not be surprised to see that there’s a difference of color between older cabinets and molded cabinets. This usually happens because natural wood furniture (especially that made of cherry) gets darker in time. Inserting glass in a cabinet door is a good idea, and it will make your kitchen look refreshed. Glass panel sellers believe that decorative glass has the ability to provide kitchen cabinets with a custom look. However, not every cabinet door can be provided with glass. You will have to check and see whether your cabinet doors feature a removable panel on their back. As far as glass types are concerned, the number of options is unlimited; you can opt for bubbles, antique glass, raindrops on water, or contemporary designs for only $7/sq. ft. This means that two normal cabinet doors provided with glass will only cost $40. 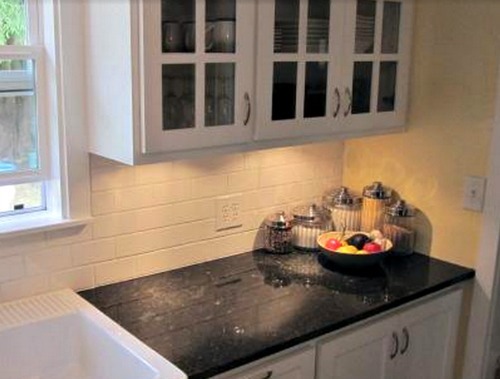 People used to light their kitchen using under-cabinet lights, which were very expensive and messy. However, things have changed since then, and your kitchen tasks are today lighted from the inside with amazing peel-and-stick LED lights that are powered by batteries. A battery-powered light is not as bright as its hard-wired cousin, but it’s affordable, meaning that you can buy several of them and place them within your kitchen cabinets. Believe it or not, LED light bulbs can be used for thousands of hours before being replaced. Updating kitchen cabinets is an excellent way of adding touch of elegance to your cooking space. Whether you choose to repaint cabinets, open them up or change the doors, your goal should be make the space look modern and practical. Let’s not forget that the kitchen is the most important room of the house, and it must always look impeccable. I did this once. I had dark wood cabinets. The kitchen always seemed dark and no amount of color in the decoration could make it cheerful. I discovered that updating kitchen cabinets can make a big difference and did not have to cost a lot. For under $100 I had brightly painted kitchen cabinets and the kitchen took on a whole new character. Caution: Updating kitchen cabinets can lead to other projects. Perhaps it is better just to leave things the way they are.